What do you think of when people mention ‘Easter’? 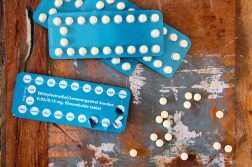 Chocolate eggs, Easter egg hunts, cake, hot cross buns… But this year, one of these could be put at risk. Raisin prices are set to soar due to a recent heatwave in California which caused wildfires to destroy thousands of acres of vineyards, significantly reducing the yield of sultanas, currents and raisins. This means that raisin prices have risen by 50% since September, and this will have a knock-on effect on the prices of hot cross buns. It is estimated that only 275,000 tons of raisins will be produced in 2017-18 in California, which is 15% below the five-year average. British bakeries are therefore looking elsewhere to source their raisins, such as Turkey and Greece, who have consequently hiked their prices by around 30%, whilst also having produced fewer raisins than previous years. The effects of this could be a rise in price of hot cross buns, fewer buns in a pack, and that there might be less fruit in each bun. 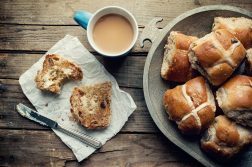 We might also see a rise in non-traditional hot cross buns, such as chocolate chip or orange, which could be a good thing for all the dried-fruit haters out there who just pick the raisins out. It is believed that hot cross buns originate from St. Albans, Hertfordshire, where a 14th Century monk at the Abbey developed a similar recipe called the ‘Alban bun’ which he distributed to the poor on Good Friday. The traditional Alban bun contains currants, and the cross on top is not piped, but formed with two slices of a knife. 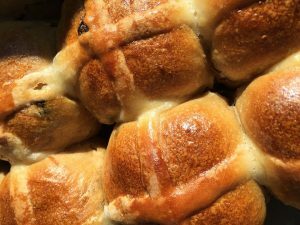 So, either go out and get traditional hot cross buns before the prices rise, or enjoy the alternatives!